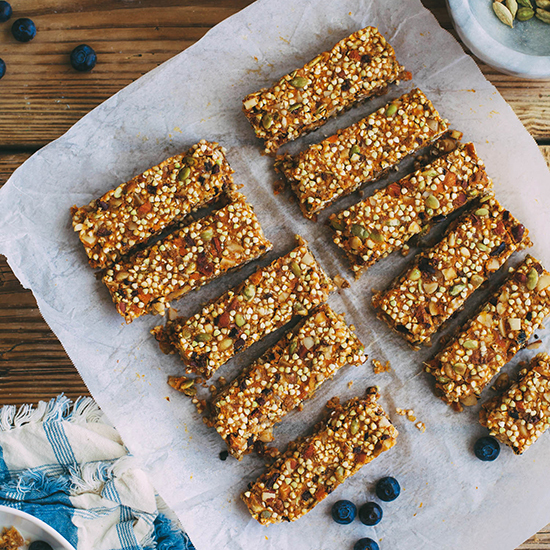 Fuel yourself on the go with snacks that range from chewy sweet potato and buckwheat bars to soft, crumbly raspberry bars. 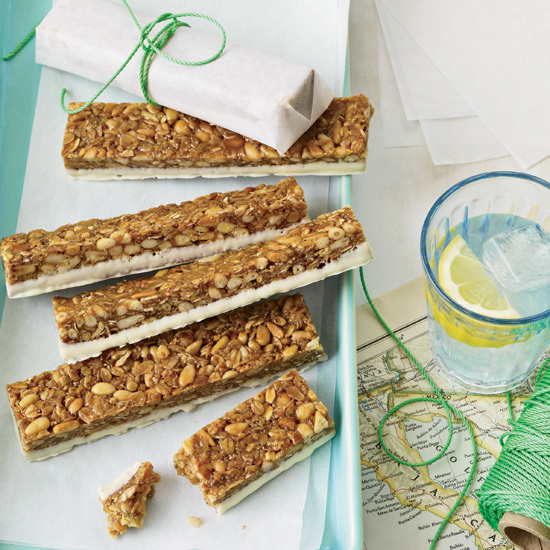 There is no added sugar in these crunchy, chewy bars. For best flavor, be sure to use the California Blenheim apricots called for below rather than other imported varieties. 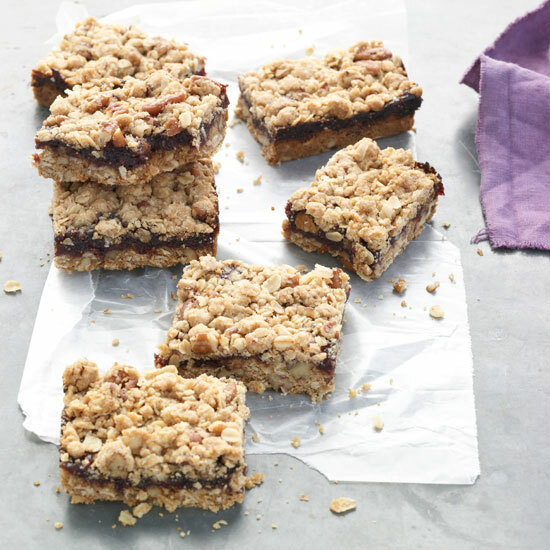 These crumbly soft, jammy-sweet bars travel well, so they're ideal for school bake sales. They're delicious made with any flavor of jam, as well as the raspberry preserves called for here. 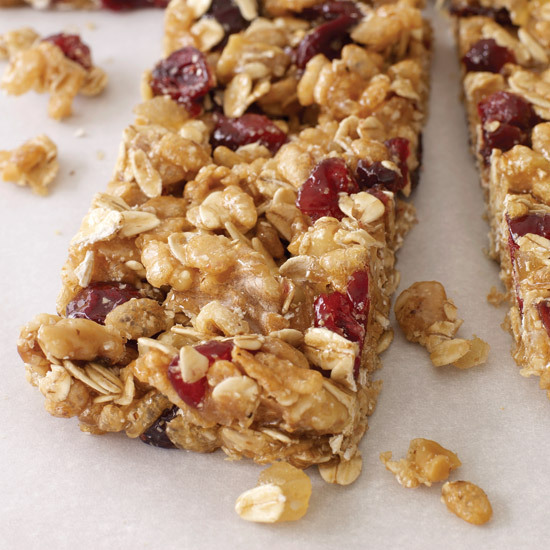 These granola bars are packed with flavor and nutrients. Protein-rich buckwheat groats are bound together with a baked sweet potato and cardamom "caramel." Cardamom is at it's best when freshly ground from green pods, but pre-ground cardamom powder can be used as well. These chewy, nutty, white-chocolate-dipped sweets are a little bit granola bar, a little bit trail mix. 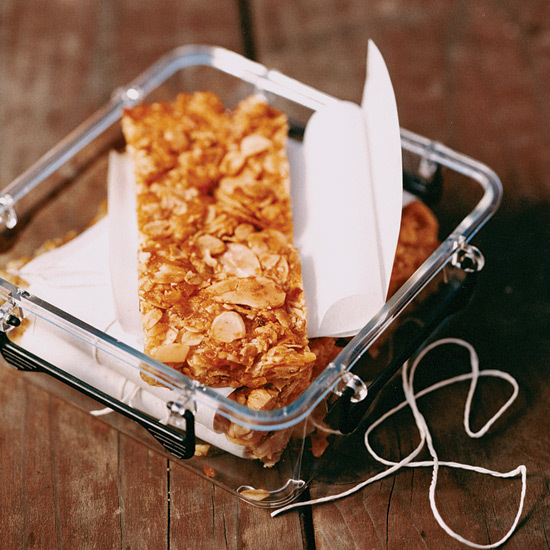 These honey-flavored cereal bars with puffed rice and toasted oats make a great substitute for store-bought energy bars. 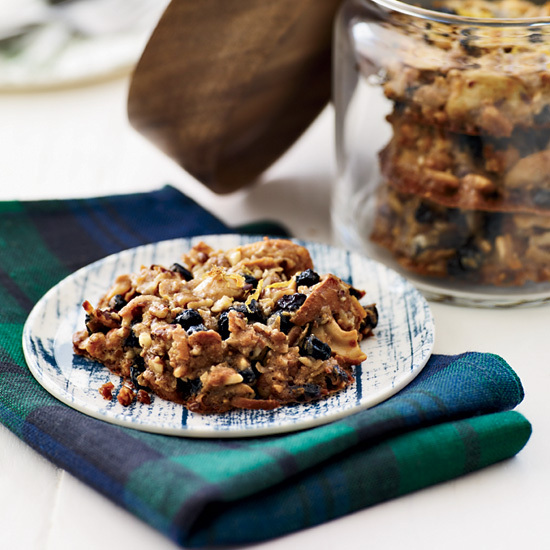 They can be made with almost any mix of nuts and dried fruit. 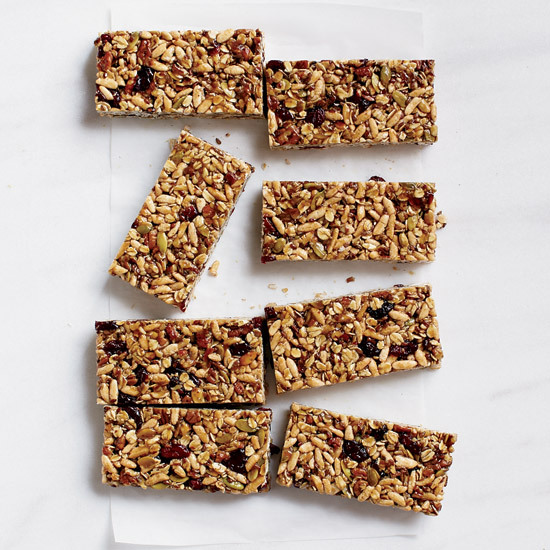 These oat bars, packed with fruit and nuts, are like delicious granola made to go. 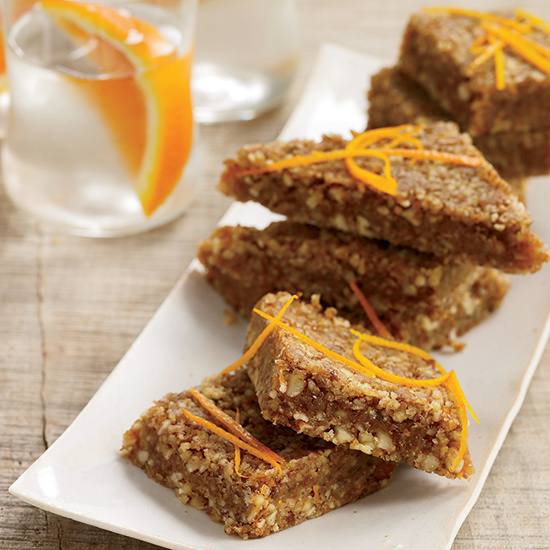 These gingery, nutrient-packed bars use only natural sweeteners like brown rice syrup and natural cane sugar. These chewy-and-crunchy bars incorporate kamut flakes, dried figs, peanut butter, flax seeds, dried blueberries and unsweetened coconut flakes. 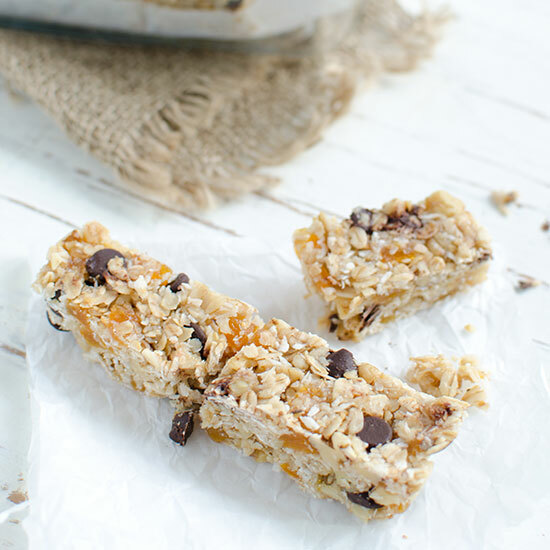 The crunchy, almondy topping for these clever bars is loaded with vitamin E. The filling is chewy like caramel and is full of vitamin C from the orange.